TC-3 is extremely effective for winterizing the poly-pipe line from the Jet Pump to the foot valve or from the Submersible pump to the pressure tank, allowing you to shut off your heat trace. TC-3 requires “The Clozer” for its operation, as “The Clozer” pumps the non-toxic plumbing antifreeze down the ¼” plastic tube (attached to TC-3) into the poly-pipe line, leaving that line full of a liquid for easy start up – no priming in the spring. Heated waterline costing too much? Priming your water pump frustrating? Sick & Tired of struggling with your foot valve or submersible pump? Spring & Fall? Worried about your water line to the well (drilled or dug)? Keeping your heat trace line on at the cottage? Even when you are not there???????? 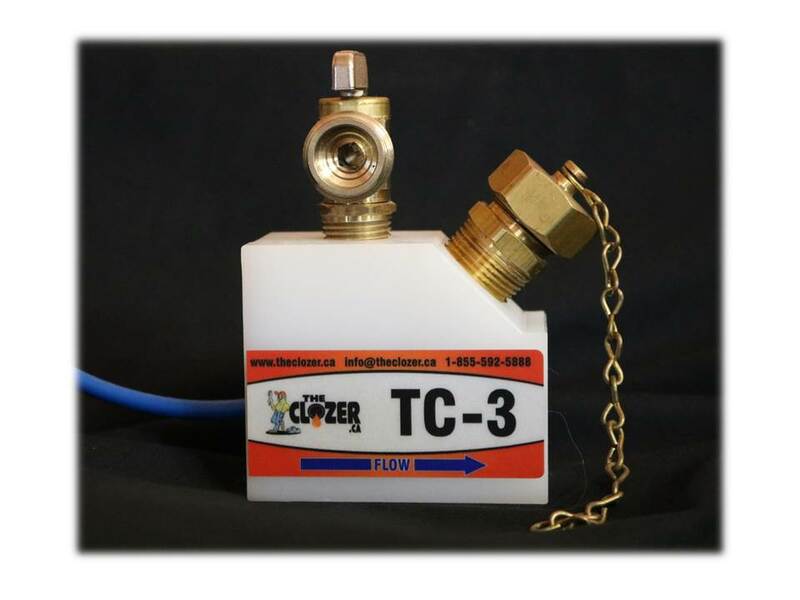 With TC-3, a valve created by THE CLOZER there is more convenience and savings for you. FALL/WINTER: This unique system, THE CLOZER + TC-3, can fill your suction line with non-toxic plumbing anti-freeze. This allows you to SHUT OFF your HEAT TRACE LINE while away from the cottage during the winter, saving you money on electrical bills. When you come back to the cottage, simply switch on your fresh water supply and flush the plumbing system, as your suction line is already primed and ready to go. Turn on your heat trace line, and you are back in business………. The business of having fun. SPRING: Cottage owners that have ever primed their pump and suction line in the spring know that it is a hit or miss proposition and very time consuming. Connecting THE CLOZER with TC-3 makes this thankless job so much easier. Preserving costly plumbing systems, lines and pumps – THE CLOZER + TC-3 saves your investment, your time and most of all your money.